Sheila Scott OBE (27 April 1922 – 20 October 1988), was an English aviator who broke over 100 aviation records through her long distance flight endeavours, which included a 34,000-mile (55,000 km) "world and a half" flight in 1971. On this flight, she became the first person to fly over the North Pole in a small aircraft. Born Sheila Christine Hopkins in Worcester, Worcestershire, England, she had a turbulent childhood and did not do well at the Alice Ottley School, nearly being expelled several times. During World War II, she joined the services as a nurse in a naval hospital. In 1943, she started a career as an actress as Sheila Scott, a name she maintained long after she stopped acting. She had a short marriage from 1945 to 1950 to Rupert Bellamy. In 1958 she learned to fly going solo at Thruxton Aerodrome after nine months of training. Her first aircraft was a Thruxton Jackaroo (converted Tiger Moth) G-APAM which she owned from 1959 to 1964. In April 1966 she bought her Piper Comanche 260B G-ATOY named Myth Too in which she set ninety world records. Her first solo round the world flight commenced at London Heathrow on 18 May 1966 and returned on 20 June 1966, having covered approximately 31,000 miles (49,890 kilometres) on 189 flying hours in 34 days. 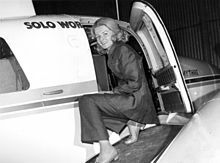 In 1969–70 she flew solo around the world in the same aircraft a second time. This aircraft was severely damaged in 1979 (after she sold it in 1971) and the remains are on display in the collection of the National Museum of Flight, East Fortune, East Lothian, Scotland. She later used a borrowed Piper Comanche 400 N8515P to set more records. On 20 November 1966, she appeared as a contestant on the American panel show What's My Line. In 1971 she bought a twin-engined Piper Aztec 250 G-AYTO named Mythre  in which she completed her third solo round the world flight in the same year. This aircraft was destroyed in a flood at the Piper factory in Lock Haven in 1972. She was the founder, and the first governor, of the British branch of the Ninety-Nines, an association for licensed women pilots, which had been created by Amelia Earhart. She was a member of the International Association of Licensed Women Pilots, and of the Whirly-Girls, an association of women helicopter pilots. She was appointed an Officer of the Order of the British Empire (OBE) in 1968. One of the teaching buildings at the University of Worcester is named after her. She received the Brabazon of Tara Award in 1965, 1967, 1968. She received the Britannia Trophy of the Royal Aero Club of Britain in 1968, and the Royal Aero Club Gold Medal for 1971. Before her death, Scott lived in a bedsit in Pimlico in poverty. She was diagnosed with cancer and died at age 66 at the Royal Marsden Hospital, London, in 1988. ^ General Register Office index of births registered in April, May, June 1922. Name: Hopkins, Sheila C. Mother's Maiden name: Kenward. District: Worcester. Volume: 6C. Page: 239. ^ a b c d e f "Sheila Scott 1. Data File". soloflights.org. Retrieved 26 April 2015. ^ a b c d e Lomax, Judy (29 October 1988). "The High Deeds of Sheila Scott". The Spectator. p. 24. Retrieved 26 April 2015. ^ "Sheila Scott (1927–1988), Pioneer Aviatrix". Aviation Pioneers : An Anthology. CTIE. Retrieved 26 April 2015. ^ "UK Register of Civil Aircraft – register entry – G-APAM-1" (PDF). Civil Aviation Authority. ^ "UK Register of Civil Aircraft – register entry – G-ATOY" (PDF). Civil Aviation Authority. ^ Swopes, Bryan R. (18 May 2015). "Piper PA-24-260B Comanche". Women in Aerospace History. Retrieved 2 January 2018. ^ Meunier, Claude. "List of solo flights around the world". Retrieved 2 January 2018. ^ "What's My Line IMDb episode listing". Retrieved 16 February 2015. ^ Swopes, Bryan R. (11 June 2015). "11 June–4 August 1971: Sheila Scott, OBE". Women in Aerospace History. Retrieved 2 January 2018. ^ "No. 44484". The London Gazette. 1 January 1968. p. 14. ^ "University of Worcester Clinical Skills & Simulation Centre Sheila Scott Building" (PDF). University of Worcester. Retrieved 26 April 2018. Hahn, Michael (31 October 2002). "Sheila Scott". Great Images in NASA. Archived from the original on 17 January 2006. Retrieved 23 March 2006.